After Eugene Cernan and his crew stepped off their helicopter and Apollo's lunar programme began its recession into history, many commentators have tried to weigh up its position in history with arguments that range from Apollo as a shallow political stunt hatched from the hubris of America's political establishment, to it being the first step in the movement of our species off this planet into the wider cosmos. Perhaps it depends on whether the glass is seen as being half empty or half full. As for myself, I am with Bradbury and his glass-half-full notions. In my perhaps naive optimism, I cannot help but see Apollo as having been a strange, mad but ultimately satisfying adventure of the human spirit. Whatever basal national posturing created it, or filthy pork-barrel politics spread its wealth around, I see in the people of Apollo a generation who rose above such narrow concerns to take one of the most powerful nations on Earth to the Moon and realise a dream that had haunted us since culture existed, and do it in a way that was laid bare to the world -mistakes as well. As I studied Apollo, I was always impressed at the monumental dedication of the people associated with the programme; people who would gladly work 16- to 18hour days, 6 or 7 days a week without the weight of totalitarian dictatorship ruling them; people who felt in their bones that Apollo contained a historic significance that transcended its genesis; people who thought that going to the Moon was just the greatest, coolest thing to have ever been involved with. I count myself as having been hugely blessed to have lived in an age when such dedication could do what it did. I rejoice that I grew to see a new form of bravery in the men who rode the rockets. This kind of heroism did not require a person to engage in the slaughter of fellow men and women for the sake of an ideal, but instead it required trust in the brilliance, hard work and imagination of hundreds of thousands of people who placed you at the top of a fantastic machine that could easily kill you, but on most occasions, did not. Rather, it took you on a voyage of momentous discovery. In the wake of the first moonlanding, NASA commissioned film director Theo Kamecke to make a reflective documentary about Apollo 11's journey. While pondering on the dawn of the mission's launch day, the narrator asked, "In what age of man will the meaning of this morning be understood?''. The short answer is: Probably not in this one. Detractors who ask why Apollo should have consumed so much of America's resources while poverty, disease and hatred exist in the world, are asking the wrong question. It is not in the nature of our species to resolve every problem before doing something creative, otherwise we would never have had impressionist art, theories of relativity or Egyptian pyramids. Perhaps Apollo was really about going and seeing what is out there; and who, as a child, did not want to do that? The process whereby a substance is removed by charring and erosion under great heat. Used in Apollo heatshields. Abort guidance system. Pronounced 'aggs'. This was a simplified guidance system in the LM that was intended to guide the ascent stage back to a safe orbit should the primary guidance system fail. Apollo lunar surface experiment package. Scientific instruments deployed on the lunar surface by Apollos 12 and 14 through 17. Alignment optical telescope. The optical instrument used in the LM to allow its guidance platform to be aligned using the stars. The highest point of an orbit around Earth. See also 'Perigee'. The highest point of an orbit around the Moon. See also 'Perilune'. Auxiliary propulsion system. Modules attached to the S-IVB to provide attitude control of the stage when the main engine was not running, and roll control when it was. Ascent propulsion system. The single engine and its associated engineering that lofted the LM ascent stage off the Moon and into lunar orbit. Apollo range instrumentation aircraft. EC-135 jets, based on the Boeing 707, used for Apollo communications where required and where there were no ground stations. The direction a spacecraft is pointing at a particular moment in time, i.e. its orientation. Usually measured against some kind of reference orientation. In the context of launch from Earth, it is the heading, stated with respect to true north, that the launch vehicle flew from the launch pad. Apollo 11 was launched on a flight azimuth of 72 degrees. Body mounted attitude gyros. A set of strapped-down gyros that formed the attitude reference for the SCS, the backup control system. Being strapped down meant that they measured rate of change of attitude rather than absolute attitude. The latter was derived from them electronically. Boost protective cover. A shroud attached to the launch escape tower, but which covered the command module during ascent through the atmosphere. (2-orbit) rendezvous sequence. It shaped the LM's trajectory to run a constant 28 kilometres below the CSM's orbit. Cislunar space The region of space between Earth and the Moon. CM Command module. The only part of the Apollo system that made the entire trip to the Moon and back again by virtue of its heatshield. It was where the crews were housed for most of the mission. which ran software called Colossus. The command module had two DSKYs to operate this machine. CMP Command module pilot. Crewman responsible for the operation of the CSM under the commander. He flew the spacecraft during docking, engine burns and re-entry. COAS Crewman optical alignment sight. An optical aid, rather like a gunsight, that provided a calibrated line of sight to a target. LM that dealt with guidance, navigation and control. CSI Coelliptic sequence initiation. The first manoeuvre in the conven tional (2-orbit) rendezvous sequence. It placed the LM in an 84-kilometre circular orbit. CSM Command and service module. The unitary Apollo spacecraft right up until the time of re-entry. DAP Digital autopilot. A computer routine that maintained the space craft's attitude within the dead band around an ideal figure. Dead band The degree of tolerance around an ideal attitude within which the DAP did not try to actively correct any attitude error. The width of the dead band could be set to be either % degrees or 5 degrees from ideal, depending on how accurately the spacecraft needed to be pointed. DSE Data storage equipment. A multitrack digital and analogue recorder that stored a suite of engineering data from around the spacecraft as well as the voices of the crew. DSKY Display and keyboard. Pronounced 'diss-key'. The unit used to communicate with the spacecraft's computer. ECS Environmental control system. A collection of subsystems that took care of the spacecraft's temperature and air supply. Saturn launch vehicle was flying outside predetermined limits. It could automatically initiate an abort or present enough information to the crew to allow them to initiate it. ELS Earth landing system. This was primarily the parachutes and their deployment systems that ensured a safe landing on the ocean. Entry Interface An arbitrary altitude of 400,000 feet or 121.92 kilometres at which NASA's trajectory experts deemed re-entry had begun for the sake of flight path calculations. EVA Extravehicular activity. The practice of leaving the pressurised confines of a spacecraft to go outside wearing a spacesuit. Evaporator A device for losing excess heat from the spacecraft through the evaporation of water. FIDO Flight dynamics officer. A console within the MOCR concerned with planning the CSM's trajectory to the Moon. Free return A trajectory to the Moon which includes the inherently safe option of returning to Earth without any propulsion. Fuel cell A device that reacted two replenishable chemicals together to produce electricity. On the Apollo spacecraft, hydrogen and oxygen were used. GNC Guidance, navigation and control. The process of determining where a spacecraft is, where you want it to go and how you get it there. It is also the term for one of the flight controller consoles in the MOCR concerned with the equipment in the command module for carrying out this function. Guido A console within the MOCR concerned with planning the space craft's trajectory. Pronounced as 'guy-doe'. Heliocentric An orbit around the Sun, or one that is Sun-centred. Hypergolic A family of propellants that have the useful property of igniting spontaneously when brought into contact with each other. A ubiquitous example is hydrazine fuel and nitrogen tetroxide. IMU Inertial measurement unit. Attitude reference system consisting of a gyroscopically stabilised platform and a set of supporting nested gimbals. Inertial A mode of attitude control that maintains a fixed attitude with respect to the stars. LET Launch escape tower. A tower fitted to the top of the command module that carried a powerful solid rocket motor. In the event of a launch abort in Earth's atmosphere, it pulled the CM clear of a failing launch vehicle. LGC Lunar-module guidance computer. The computer system in the lunar module which ran software called Luminary. LM Lunar module. The two-stage landing craft used to take crewmen from lunar orbit to the surface, sustain them during their exploration and return them to the CSM. Pronounced as 'lem'. LMP Lunar module pilot. Second crewman in the lunar module. He did not actually pilot the LM but acted as a flight engineer and co-pilot, aiding the commander in the LM's operation. LOR Lunar orbit rendezvous. The name of the mode by which Apollo got to the Moon. It required that two spacecraft rendezvous in lunar orbit. LOX Liquid oxygen. Used as an oxidiser in all three Saturn stages. Mare The scientific name derived from Latin given to the smooth dark areas of the Moon, commonly called 'seas'. Pronounced as 'maa-ray'. Maria The plural of mare. 'poker'. Often termed 'mission control', it was the hub of the flight control effort during a mission and was supported by various nearby rooms in the task. NASA National Aeronautics and Space Administration. The agency that was tasked with running the American space programme, including Apollo. Noun An expression referring to a particular register, or set of registers within the Apollo computer. Orbital rate A mode of attitude control that maintains a fixed attitude with respect to the ground, making the same side of the spacecraft always face the surface below. OPS Oxygen purge system. An emergency package of oxygen contained in a high-pressure bottle. It was carried on top of the back packs during lunar surface forays. The CMP also carried it while retrieving the film canisters during their return to Earth. ORDEAL Orbital rate display, Earth and lunar. An add-on box installed during flight that made the spacecraft's attitude displays show attitude with respect to the ground. Capcom to the crew. Typically, this data pertained to an upcoming burn, an abort procedure or other manoeuvre that required precise numerical control. It was customary for the crew to read the PAD data back as a check. Pericynthion The lowest point of approach to the Moon of a body coasting in from beyond the Moon's sphere of influence. Perigee The lowest point of an orbit around Earth. See also 'Apogee'. PGNS Primary guidance and navigation system. Pronounced 'pings'. This was the LM's means of knowing where it was, and of getting to where it wanted to go. It was broadly similar to the computer, IMU and optical G&N system in the command module. RCS Reaction control system. A collection of small rocket engines arranged around a spacecraft to control its attitude and allow small translation manoeuvres. Reference to a stable member matrix. A definition of an orientation in space according to which the stable member of an IMU (i.e. the platform) could be aligned. The surface layer of rubble and dust that is draped across the Moon's entire surface. It builds up over huge expanses of time to depths of tens of metres. A console within the MOCR concerned with plotting possible trajectories for a return to Earth. 1. An orbit whose motion is in the opposite direction to the rotation of the body around which it is orbiting. 2. An engine burn whose thrust is counter to the motion of the spacecraft. Used to slow the spacecraft down. Rocket propellant-1. The type of highly refined kerosene (or paraffin) used as fuel in the first stage of the Saturn V. Real-time computer complex. A large room within the mission control centre in Houston filled with IBM 360 mainframe computers that supported the data processing needs of a flight. Stabilization and control system. The command module's backup to the G&N system. It had its own gyroscopes for attitude reference, the BMAGs. Sequential event control system. Automatic system for controlling the timing of complex and perhaps fast events. The first and most powerful stage of the Saturn V launch vehicle. The second stage of the Saturn V launch vehicle. Scientific instrument module bay. A package of scientific instruments and cameras built into the previously empty 'sector 1' of the service module. The third stage of the Saturn V launch vehicle. It was also used as the second stage of the Saturn IB. Spacecraft/LM adapter. Pronounced 'slaw'. A conical shroud below the service module that housed the lunar module throughout launch. Service module. 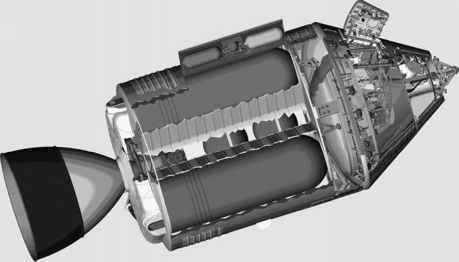 A cylindrical section of the Apollo spacecraft that housed most of the consumables and propulsion systems. Trans-Earth injection. A major rocket burn made to send a spacecraft on a trajectory to Earth. Translunar injection. A major rocket burn made to send a spacecraft on a trajectory from Earth orbit to the Moon. Terminal phase initiation. A manoeuvre that set the LM on a trajectory, known as the terminal phase, that would intercept the CSM across 130 degrees of orbital travel. Brewer's term for the part of a barrel not filled with liquid. In rocketry, an ullage burn settles liquid propellant to one end of its tank. Vehicle assembly building. The 160-metre box-shaped structure at the focus of Kennedy Space Center where the components of the Saturn V launch vehicle were stacked. Verb A numerical code interpreted by the Apollo computer as an instruction.